Utah Valley Kenneth Ogbe dives to the floor for a loose ball with UTRGV Moe McDonald in the 1st half of the game at UTRGV Field house Thursday Jan.18,2018, in Edinburg. Utah Valley was called out of bounds. 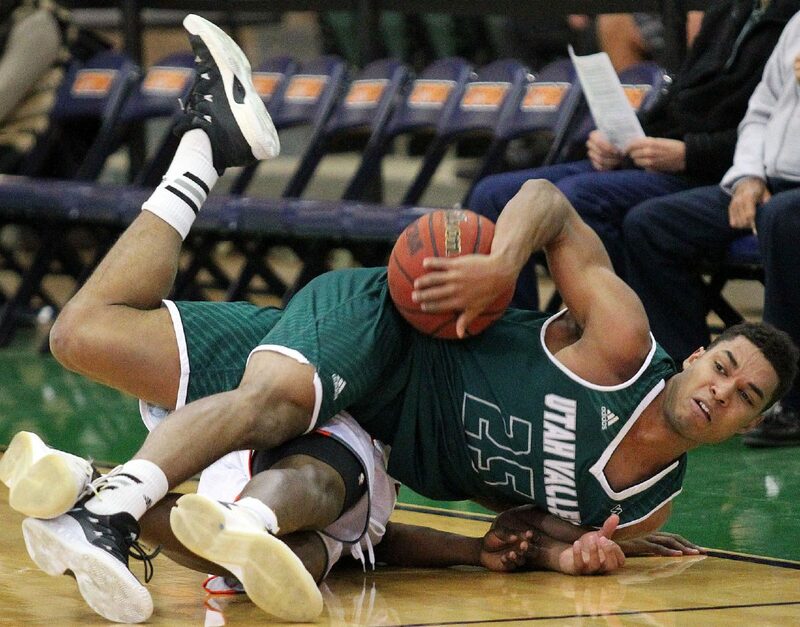 EDINBURG — On UTRGV’s first offensive possession against Utah Valley, Terry Winn snatched a rebound, converted a layup and then bumped chest-to-chest with 7-foot, 243-pound center Akolda Manyang — UVU’s leading scorer and rebounder. Later, as the game was winding down, Manyang leapt into Winn and threw down a thunderous dunk. As the referee whistled for a foul against UTRGV, Manyang hung from the rim and looked down at Winn, who could only smile. Manyang finished with 15 points and 12 rebounds, and his dunk with 2:53 to play was one of the final daggers as Utah Valley used hot shooting to hand UTRGV an 84-76 loss on Thursday at the UTRGV Fieldhouse. UTRGV Nick Dixon is defended by Utah Valley Connor Toolson in the 1st half of a game at UTRGV Field house Thursday Jan.18,2018, in Edinburg. The last laugh belonged to Utah Valley, as the Wolverines shot 47.6 percent from the field and 38.5 percent from beyond the arc with 21 assists against 14 turnovers. The first half was especially explosive, as Utah Valley shot 19 of 33 (57.6 percent) from the field and 6 of 12 (50 percent) from 3-point range. Hill said UTRGV (10-10, 2-2 WAC) especially had issues guarding UVU (15-5, 4-0) in transition, failing to get back and communicate. The Wolverines regularly went over or around the Vaqueros press, creating fast-break opportunities or kicking out for open 3s after UTRGV collapsed on a driver in the paint. “I didn’t know they ran or pushed the ball the way they did,” Winn said. Conner Toolson led UVU with 23 points on 6-of-11 3-point shooting. Kenneth Ogbe scored 17 points, while Brandon Randolph notched 12 assists. Dixon tried to keep UTRGV close, finishing with a team-high 26 points, nine rebounds and five assists. He said the key to his big night was simply staying patient and taking what the defense gave him. Dixon scored 19 in the first half but didn’t record his first point after the break until 6:15 remained in the game. Dixon hit 10 of 20 shots from the field, but the rest of the Vaqueros were 18-of-51 shooting (35.3 percent). Xavier McDaniel Jr. scored 15 points, and Winn had 14 points with seven rebounds. As a team, the Vaqueros racked up 20 assists against nine turnovers. UTRGV never led in the game, while Utah Valley built an advantage as large as 14 points in the first half before taking a 51-46 edge into the break. 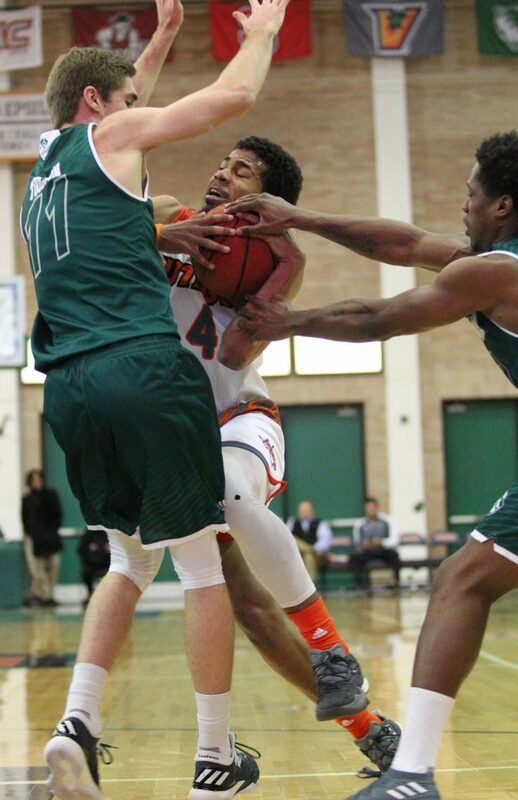 The Wolverines stretched the margin to 13 less than four minutes into the second half before UTRGV switched to a zone defense that limited UVU for a stretch. When Dixon knocked down a 3-pointer to cap a run of five points in eight seconds, UTRGV was within 71-66 with 5:21 to play. But the Vaqueros never pulled any closer, as the Wolverines continually hit big shots to protect their lead.